I was hooked on Paramore as soon as I first heard Misery Business, way back when it came out in 2007. Meaning I was just 12 years old when I became hooked. Since then my love for Paramore has only grown more and more. One reason I love the band is because of Hayley Williams, she always stood out to me, she wasn't part of the crowd she was her own person and really didn't seem to care. This is something I always incorporated into my own life. I didn't want to be like everyone else and Hayley proved to me you could stand out and be different and not have to worry about it. Another thing that really caught my eye with Hayley is how she dresses over the years her style has really developed and it is one I love. Here are just a few of the ones I really wish I could pull off or that I have always tried incorporating into my own wardrobe and style. I really wish I could pull off the really short shorts and tights look, however my legs have never been a part of my body I like having on show. Even playing football my socks would be pulled right up and my shorts would be as baggy as possible. I love the way she pairs the shorts with jumpers and Vans perfect for those cooler days. These images capture the perfect style to me. The printed t-shirt, ripped jeans and leather jacket partnered with some nice shoes or Doc Martens. I am really going all out when I have got to my goal weight and buying my perfect wardrobe and I can guarantee all these items will find their way into it. 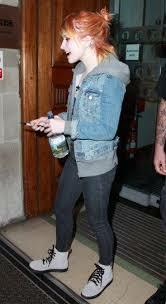 For the more casual look I absolutely adore the boots, dark skinny jeans, hoody and denim jacket over a t-shirt look. I have my own little variation of this outfit which is my vans, black skinny jeans, plain t-shirt and hooded denim jacket with jersey sleeves. 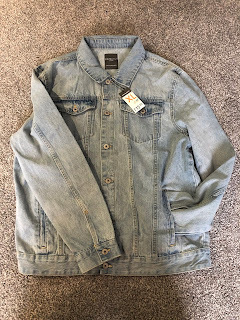 However once I have lost a bit of weight I am going to finally invest in a nice denim jacket and some good quality hoodies. Once I have got these I think some nice boots for the winter will come in handy. This type of outfit is also perfect to team up with a beanie when its a little colder outside. Finally is my favourite type of outfit for a bit of a smart casual look for parties or meeting up with people for drinks. 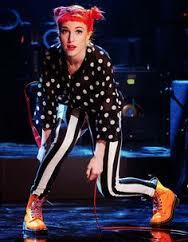 I love how Hayley pulls off the patterned legging and jeans. Whilst mixing this with a complementing sheer shirt and Doc Martens. I am hoping that once I am more confident within myself and my body that I can step out of my comfort zone and give a version of these outfits a go. 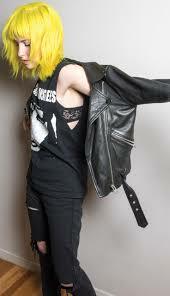 What do you think to Hayley's style? Do you know of any shops that are best for these types of outfits? Let me know.